This is the second volume of contributions from the 36th Symposium of the European Marine Biological Association held at Maó, Menorca, September 17-22, 2001. 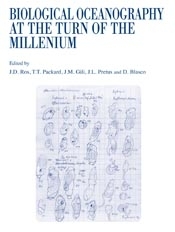 The first one, A Marine Science Odyssey into the 21st Century (Sci. Mar., 65 (Suppl. 2), 2001) was published before the symposium. Here twenty-five of the papers on algology, benthic ecology, aquatic biofilms, physical oceanography, plankton ecology, enzymology and other topics that were presented at the Symposium are included. This international meeting was conceived as an honor to Professor Ramon Margalef, whose practice of open curiosity-driven investigation have inspired many to enter science as a career. In pursuing this spirit of Margalevian science, six objectives were incorporated in planning the symposium and preparing this volume: (1) to encourage cooperation rather than competition; (2) to stimulate the conception of future experiments through the discussion of past results; (3) to encourage the spirit of curiosity-driven investigation; (4) to encourage imagination, creativity, and innovation; (5) to minimize the costs of scientific communication, and (6) to encourage careful integration of new results into the multidimensional matrix of existing knowledge. We hope that the readers of this volume benefit from this philosophy.